I know not to expect much from the Wachowski’s, but speed racers rocks, and this will give us a good taste on how good all the new American Anime remakes will look in the coming future. What I want to see is Hollywood running so out of ideas that they have to start importing African culture (Tarzan does not qualify). I read somewhere that they were using special cameras that would allow both the foreground and background to be in focus simultaneously. I want to watch this, partly because I want to see how it looks. I saw one of those “Entertainment Tonight” behind the scenes look, and the costume Matthew Fox is wearing as Racer X, and Emile Hirsh’s Speed Racer costume looks so cartoony. I saw the trailer and I think it’s kickass. Nice mindless fun, fast fantasy cars, sorta-hot chicks. I know not to expect much from the guys who made The Matrix:Reloaded and The Matrix:Revolutions and sucked the soul out V for Vendetta. After watching those three movies I’m starting to think the lady who claims they stole her script for the Matrix might not be so crazy after all. Has there ever been a good live-action movie based on a cartoon? 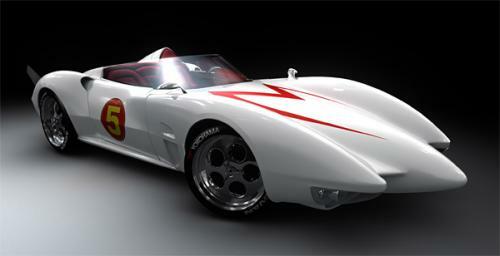 Speed Racer is going to be as “sick” as the Flintstones movie or Transformers.